For additional information, visit the official website of the Starr-Gennett Foundation. Of all the activity the Whitewater Valley gorge supported, the Starr Piano Company was the most significant. When the first piano craftsmen arrived in Richmond, Indiana in 1872, the city had two banks, a public library, and gas lighting. The next year, when the first piano was produced, Richmond became the county seat of Wayne County and had a population of 10,000. The piano factory was know under several names in its early years, but the Starr family backed the enterprise from its inception. By 1878, James and Benjamin Starr, together with a piano craftsman and creative genius named Chase, had incorporated their piano works. In that year, the company purchased the present site, on the finest waterpower on the Whitewater River. In 1893, the Starr Piano received national recognition at the Colombian Exposition in Chicago. The same year the Company was incorporated anew, with Benjamin Starr as president and Henry Gennett as the secretary-treasurer. The arrival of Gennett and his entrepreneurial skill gave a much-needed spark (boost) to the Company. By 1906, the Starr Piano Company had 600 employees. In 1916, a six-story building for the manufacture of phonographs and records was erected. Over the years, the Starr Piano, Phonograph and Gennett Records were joined by Starr Refrigerators and freezers, synchronizer units designed for use with talking picture projection machines, wooden propellers and a valve for barrage balloons during World War I, wooden cabinets for radios and even wooden billy clubs to quiet a local factory strike. No such labor disputes occurred at the Starr, as most of the craftsmen considered themselves employed for life. By the 1920's, the Starr was a broad based musical empire flourishing in the gorge on South 1st Street. The recording business had been dominated from its beginning by large firms which held valuable patents on wax engraving methods and on the recording stylus. Since 1902, the American Graphophone Company (Columbia) and the Victor Talking Machine Co. had pooled their patents on the lateral cut method of recording in an attempt to monopolize the market. The majors were challenged by a growing number of smaller manufacturers, including Vocalion, Emerson, Brunswick and Starr. The giants sought protection in the courts, and in Victor Talking Machine Co. vs. Starr Piano Company (1922) the Second Circuit Court of Appeals held the Victor patent void for lack of invention and for abandonment. Not only did the lawsuit effectively end the majors monopolization of lateral recording, it formed a bond between the smaller companies which had joined the Gennetts in the legal battle. Leasing arrangements between the companies followed, eventually involving hundreds of Gennett masters. In the mid-twenties, Gennett was producing 3 million records annually, in addition to 15,000 pianos and 35,000 spring-driven phonographs. In 1928 Gennett cut 1,250 master records, compared to Victor's nearly 7,000. Of the many exploits of Gennett, none was so noteworthy or important as the music recorded at the Gennett recording department. Located at the southern end of the Starr complex, all recording activity frequently had to cease as boxcars would rumble by the recording studio. Over the period from 1916 to 1934, the Richmond studio made thousands of acoustic and electric recordings, featuring blues, jazz, country, ethnic, classical, spoken word, and any other recorded sound that had or could have a market. William Jennings Bryan recorded his famous "Cross of Gold" speech at the Richmond Gennett studios. A list of famous names who recorded for Gennett, in Richmond and at their studio in New York, is a long one. 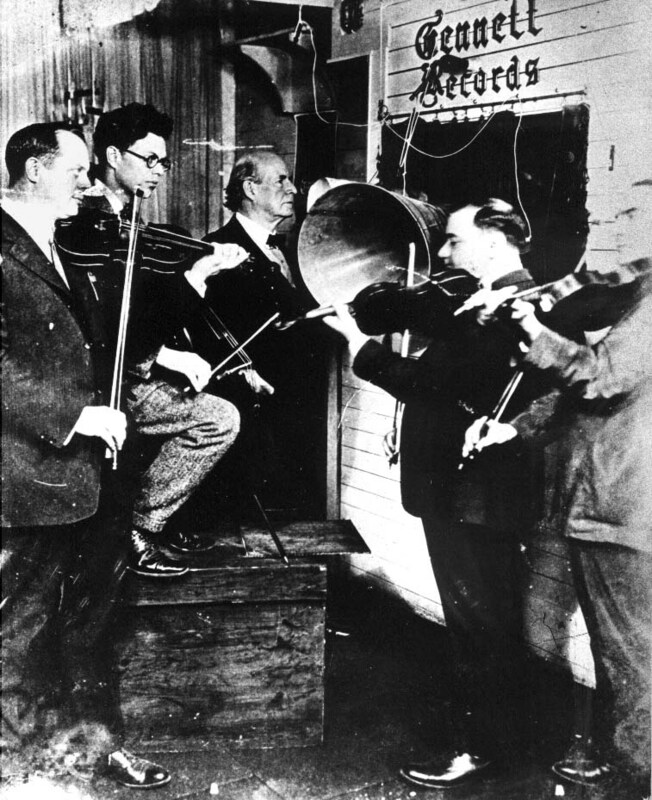 In 1922, the Friars Society Orchestra (later the New Orleans Rhythm Kings) made their first recordings in Richmond. The following year, 1923, Jelly Roll Morton waxed some records reaching over 20 masters in one day - an astounding feat for that time or any other. He also participated in the first interracial recording session with the New Orleans Rhythm Kings, the same year King Oliver's Creole Jazz Band with Louis Armstrong, Lil Hardin and Honore Dutrey performed before the acoustic horn. In 1924, Bix Beiderbecke made the first of several appearances for Gennett, with the Wolverines, and later as the leader of Bix and his Rhythm Jugglers, featuring Tommy Dorsey on the trombone. Hoagy Carmichael, a fan of the New Orleans Rhythm Kings, and Bix also performed in Richmond with Bix, Hitch's Happy Harmonists, and as leader of Charmichael's Collegians, recording the first version of "Stardust". Earl Hines was there, in Lois Deppe's band, as was Muggsy Spanier, with the Bucktown Five, Red Nichols, Billy Butterfield, Mary Lou Williams and a wonderful musical personality who worked both sides of the street. He made religious recordings under the name of Rev. Thomas A. Dorsey; for pop recordings, his name was Thomas Dorsey, and for Jug Bands, it was Georgia Tom. Wingy Manone, a fine trumpet player from New Orleans, came to Richmond in the summer of 1930 to record under the name "Barbecue Joe and his Hot Dogs." One of the tunes he recorded was "Tar Paper Stomp," that years later was revised to become "In the Mood." Unfortunately, many recording companies were ruined by the Great Depression. In 1929, record sales were $75 million. In 1930, $18 million and in 1931, $5.5 million. Gennett and numerous small labels went out of business in the early '30's. The Starr Factory continued to make pianos and press records for other concerns, but actual recording slowed to a trickle. Decca bought the rights to Gennett's "Champion" label, and in the 1940's Joe Davis briefly revived the Gennett label for jazz aficionados. Harry Gennett, Jr. and his uncle, Fred kept their hand in the business by producing sound effects records. The last Starr piano was made in the early1950's and by the mid-1960's, its buildings (750,000 square feet under roof) were slowly but steadily deteriorating. The citizens of Wayne County are embracing this wonderful heritage. Each September a "Walk of Fame" festival is held in the Whitewater Gorge where the former Starr Piano Factory was located to celebrate this priceless jazz history. Each year, new Gennett recording artists are honored and added to the Walk of Fame, with plaques honoring these artists installed in the Whitewater Gorge Park. The Starr-Gennett Foundation also supports a variety of concerts throughout the year. Official website of the Starr-Gennett Foundation. 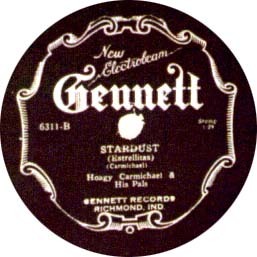 Be sure to check out their "Stories" section for the complete story of the Starr Piano Factory and the Gennett Recording Company. View Richmond's Jazz Murals presented to the city by Laurel Gennett Martin, wife of the late Henry Gennett Martin of the former Gennett Recording Company. The Red Hot Jazz Archive by Technoir - Excellent site with links to many Real Audio tracks by the original artists. Starr Piano Company - Morrisson-Reeves Library history site. 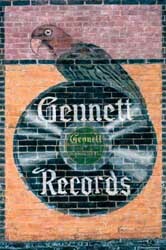 The Wolverine Antique Music Society has a page devoted the the Gennett Recording Company. Gennett Sound Recording Collection - housed in the UCLA Library. The Gennett label has been inventoried as part of a pilot project. The 1,036 Gennett discs (2,072 sides) in the collection are not in a searchable database, but the complete contents are listed for browsing. Hoagy Carmichael's Stardust - read the lyrics to this famous song...and others. Antique Record Machines - an excellent site if you are interested in collecting old 78 RPM records or old phonographs. Dates and Serial Numbers for pianos manufactured by the Starr Piano Co.
Greg's Antique Piano Page - for those of you who are interested in Starr Pianos. Greg offers links to piano restoration info, books recommendations, and even a piano classified section. How Much Is My Piano Worth? - hints in assessing the value of your piano, by PianoWorld. 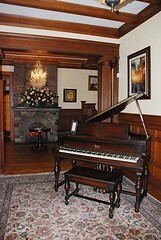 Antique Piano Shop Online Museum - be sure to check out the pages on the Richmond, Remington, Royal, Starr, and Trayser. Judith Gennett's Gennett Genealogy - a wonderful collection with with excellent references to newspaper articles, wills, etc. Of special interest is Frederick Gennett and his wife, Hazel Reid Gennett, and Henry Gennett and his wife, Alice Lumsden Gennett. Refrigeration Supplies Distributor - the Pacific Division of the Starr Piano Company has continued to be managed by Henry Gennett's descendents. Learn more about the history of this company. Doc Roberts Collection, Southern Appalachian Archives - Important subjects covered in the collection include: country music in America from the early 1920s through the 1930s and information on the commercial recording activities of the Starr Piano Company of Richmond, Indiana. Those interested in learning more about the Starr Piano Company and the Gennett Recording Company are invited to contact the Wayne County Historical Museum at 765.962.5756. The Museum currently has a display on the Gennett Recording Company and the Starr Piano Company. This article was adapted from a brochure entitled "Once there was music..." distributed by the Richmond/Wayne County Tourism Bureau. Most of the material has been excerpted from The History of the Whitewater Gorge and Andy Klein's article, A History of the Starr Piano Factory. Special thanks to Brian Jones at Photo ReStore for the use of the enhanced Gennett logo. Thanks also to the Wayne County Historical Museum for the William Jennings Bryan photo. John Finley, Richmond, Indiana mayor from 1852 until his death in 1866, wrote the poem "The Hoosier's Nest", which is often cited as the first written reference to the word "Hoosier".